Simon Perry has written an excellent beginner's guide here. The Nightingale Collaboration coordinates efforts to end misleading advertising practices. This blog reproduces the work of other authors using the "fair-use" rationale of UK copyright law. The rest of the text is presented free of copyright. You are welcome to repost, copy and/or modify any part of my work. Conscious Foods - "Honesty" and "Integrity"
Enerjii's "Feel-good vitamins of the air"
OfQuack - "Where Are We Now?" 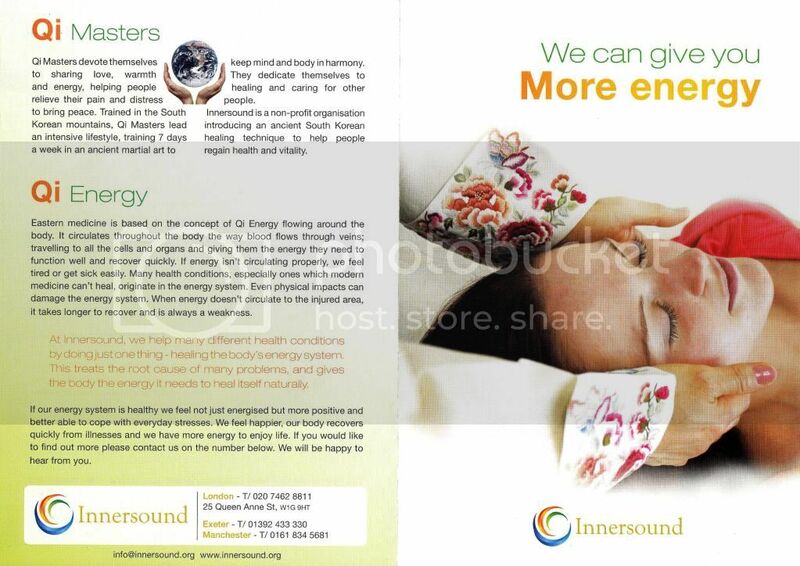 Earlier this year I found a flyer for Innersound, a charity who offer "Qi Energy Classes" and "Qi Treatments". "Depression - Digestive Disorders - Insomnia - Migraine[s] - P[re]-M[enstrual] T[ension] - R[epetitive] S[train] I[njury] - Sports Injuries - and many more..."
After I submitted a complaint, Innersound told the ASA that they would withdraw this claim in their future leaflets. Innersound were one of the exhibitors at an exhibition I recently attended. On at least three occasions, I was handed a copy of an identical flyer (available here and here) - the very same one Innersound had solemnly promised to withdraw! Actually, the word "identical" isn't quite accurate - the flyer contained some inserts that weren't there before. One of them was a photocopy of two articles from the Sunday Express and Kindred Spirit magazine. "While some of their clients may have been initially sceptical, Innersound Qi treatments have been scientifically shown to detox the body, reduce stress hormones and strengthen immunity. This healing therapy is said to help restore vitality and correct imbalance as well as relieving a variety of health conditions including pain, fatigue, depression, digestive disorders and high blood pressure." Scientifically proven, eh? Well - we'll see about that. 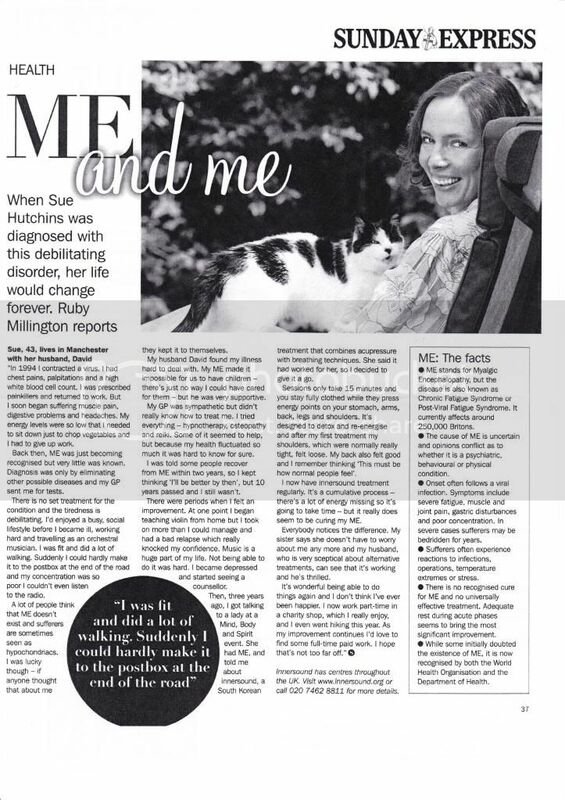 The Sunday Express article featured the story of Sue Hutchins, who suffers from Myalgic Encephalopathy (ME). "My GP was sympathetic but didn't really know how to treat me. I tried everything - hypnotherapy, osteopathy and reiki. Some of it seemed to help, but because my health fluctuated so much it was hard to know for sure." Luckily, Innersound thought they could help. 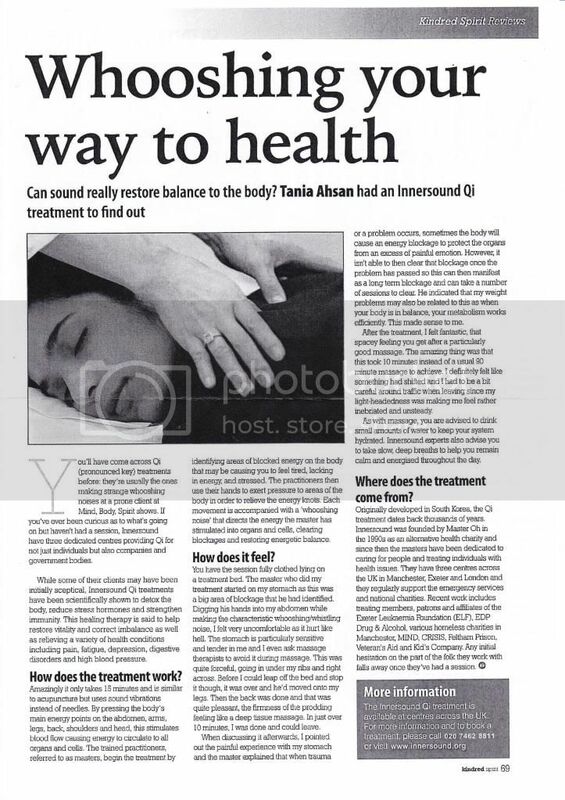 "[Innersound Qi treatments] are designed to detox and re-energise...I now have [I]nnersound treatment regularly. It's a cumulative process - there's a lot of energy missing so it's going to take time - but it really does seem to be curing my ME". I've put in another complaint to the ASA (below) - let's see if Innersound can substantiate any of their bizarre claims! "I write to complain about a flyer I picked up at the "Mind - Body - Soul" exhibition in London on 2nd October this year. 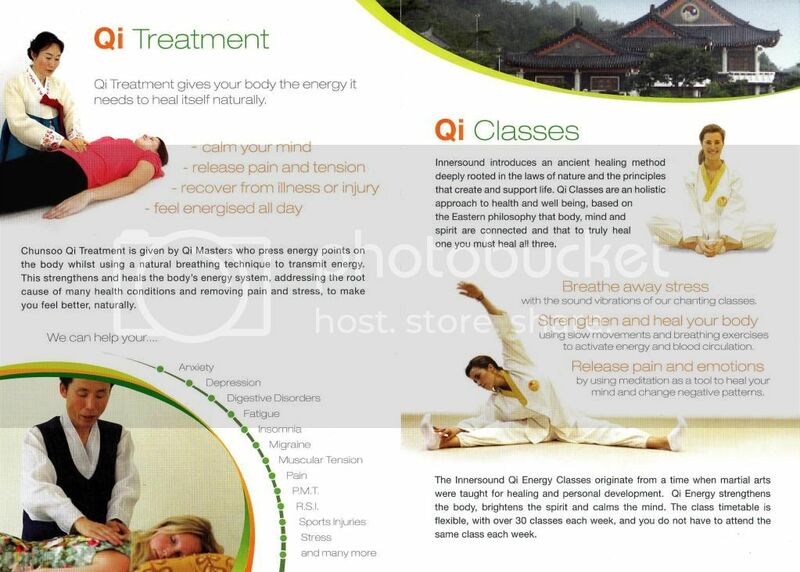 The flyer, for Innersound, promotes their "Qi Treatment" and "Qi Classes". 1. (i) In June this year, I wrote the ASA to complain about an identical flyer from the same advertisers. (ii) The flyer claimed to "help" with serious medical conditions such as depression, migraines and RSI. 2. In August, you wrote to tell me that the advertisers had "agreed to remove the references to medical conditions from their leaflet". 3. The advertisers had a stand at the exhibition. On three separate occassions, as I passed the stand, I was handed a copy of the flyer. 4. Therefore, under Section 3.7 of the CAP Code, I again challenge whether the advertisers can substantiate their claims that "Qi Treatment...can help your...Depression...Digestive Disorders...Insomnia...Migraine[s]...P[re]-M[enstrual]-T[ension]...R[epetitive] S[train] I[njury]... Sports Injuries...and many more..."
5. (i) On this occassion, the flyers I picked up contained two inserts (not stapled to the main flyer). The identical flyer I had picked up in June did not contain these inserts. (ii) With this complaint I have enclosed a scan of one side of the flyer, and both sides of one of the inserts. 6. (i) One of the inserts contained, on one side, a copy of an article from "Kindred Spirit" magazine. The reverse side of the same insert contained a copy of an article from the "Sunday Express" newspaper. (ii) My complaint treats these two articles as an advert, appearing as they do inside a flyer promoting the same treatments. (i) "Innersound Qi treatments have been scientifically shown to detox the body, reduce stress hormones and strengthen immunity"
(ii) Innersound Qi treatments can "[relieve] "a variety of health conditions including pain, fatigue, depression, digestive disorders and high blood pressure"
9. The article from the "Sunday Express" tells the story of Sue Hutchins, who suffers from Myalgic Encephalopathy (ME). 12. (i) Under Section 3.47, I challenge whether the testimonial claim that Innersound Qi treatments can "detox" the body is likely to mislead the consumer. (ii) Under Section 3.47, I challenge whether the claim that Innersound Qi treatments can "cure" Myalgic Encephalopathy is misleading, under Section 12.1 I challenge whether it can be substantiated, under Section 12.2 I challenge whether the claim discourages essential treatment, under Section 12.6 I challenge whether the treatments is falsely claimed to be able to cure illness. 13. I confirm I have no connections with the advertiser. I confirm I am not involved in legal proceedings with the advertiser." I play music at professional level, with someone who recovered from ME and could not perform for 12 years. She found her health back through Innersound....may be, this works for some not for all sufferers of ME. REcently diagnosed with cancer. I'm considering not having chemotherapy in order to regain my health through innersound. Is there anyone out there who has been healed of thir cancer through this alternative treatment? If you choose Innersound over chemotherapy, you will die a slow and agonising death. Can I put it any more simply than that? Did you know that this seemingly innocent "charity" have been exposed as being a cult. Excellent journalist who has won awards for his exposes with Amnesty International and Paul Foot award, wrote about them. They are saying that their rent, rates, wellbeing, etc is £170,000 p.a. does that sound right to you for a place in Harley St, Manchester and Exeter??? *Macushield - help for meso-zeaxanthin deficiency sufferers!